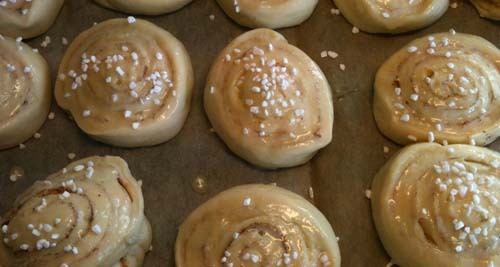 Recept från ”Sju sorters kakor” 1975, ungefär 50 styck eller två plåtar bullar. Smula jästen i en bunke. Smält smöret, blanda med mjölk och låt det bli fingerljummet. Rör ut jästen i mjölkblandningen. Tillsätt salt, socker och mjöl. Arbeta väl till en smidig deg. Låt degen jäsa 45 minuter under bakduk. Dela degen i två delar. Kavla ut varje del på mjölat bakbord. Bred på smör, strö över socker och kanel, och eventuellt russin. Rulla ihop degen. Skär i skivor och lägg i bullformar eller på bakplåtspapper på plåten. Jag brukar skära ett jack i degbiten och sno ihop till en bulle. Jäs under bakduk i 20 min. Pensla med uppvispat ägg och strö på pärlsocker. Grädda i 250 grader i 7-12 minuter i mittersta delen av ugnen. Håll koll på ugnen på slutet, de bränns lätt. You find instructive pictures below the recipe. This recipe is for about 50 buns, or two baking trays. But you may try half first, or even a quarter of the recipe, it works out all right. Crumb the yeast in a bowl big enough for the dough. Spread the salt on top of the yeast. Melt the butter in a pot. Take it from the heat and pour in the milk. Now it should be finger warm (37 centigrades). Not hotter, not colder. This is important, use your finger for measuring. Pour the buttermilk into the bowl on top of the yeast, then the sugar. Stir until the yeast is melted. Add the flour while stirring, little by little. You may not have to use all the flour. Work the dough until it feels fine. It should not be sticky and not dry, but smooth and elastic. Put a cloth on top of the bowl. Let it rise for 45 minutes in a cupboard or a draughtfree room, like in the kitchen if there are no windows open. Turn on the oven to about 225 centrigrades. Place a baking paper on the baking tray, otherwise the buns may stick. Or you can use muffin paper cups. Divide the dough in halves, or smaller bits. 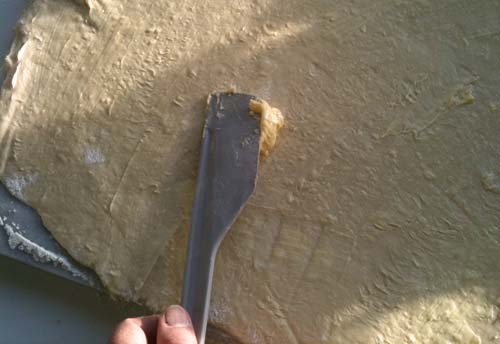 Put the bits on a floured surface and roll it out (flatten it) with a rolling pin (or a clean bottle if you have no rolling pin) until it is about 0,5-1 centimetre thick. 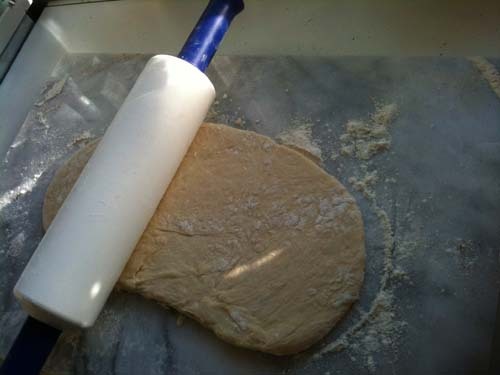 If it sticks, use flour on the rolling pin. 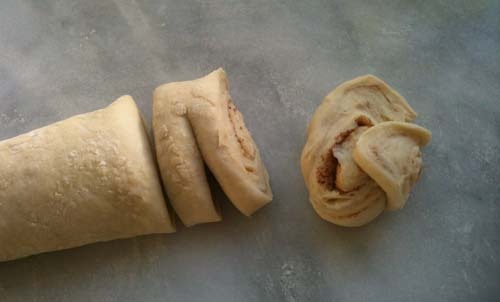 Spread the softened butter on the flat piece of dough, sprinkle some sugar and some cinnamon on top. 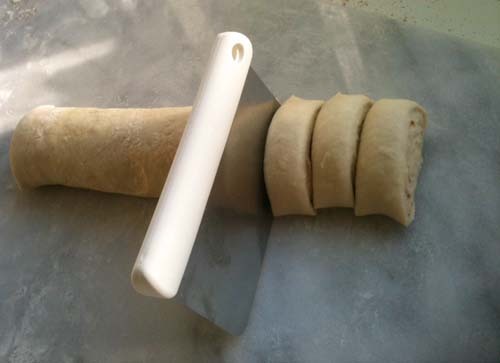 Roll up the dough (so it makes a roll). Cut pieces as big as you want the buns. I sometimes make a cut in the dough for each bun and twist it round before I put it on the baking tray. But just cutting pieces is OK.
Let the buns rise for 15-20 minutes more, under a cloth. 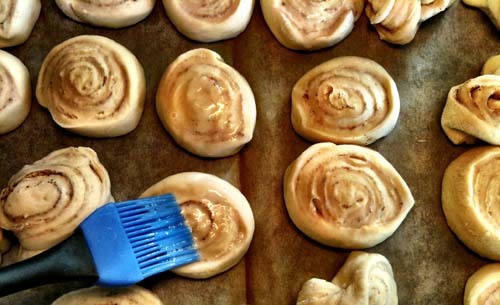 Brush the buns with the whipped egg and spread some granulated sugar on top of each bun. Bake for 7-12 minutes in the middle of the hot oven. You have to keep a look when they have turned golden brown, so they don’t burn, that is easily done I’m afraid. Eat and enjoy! You will make success with this. It may seem difficult at first but it isn’t. Calculate about an hour and a half from start to eatable buns. 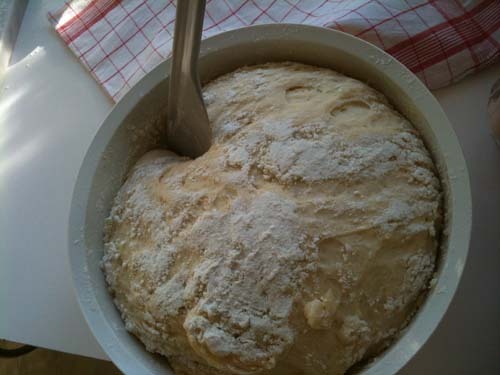 The dough after rising the first time. I divide this in two parts, and work them each at a time. Flatten the dough until it is about a half centimeter thick. This is after starting flattening. Spread the butter on the flattened dough. 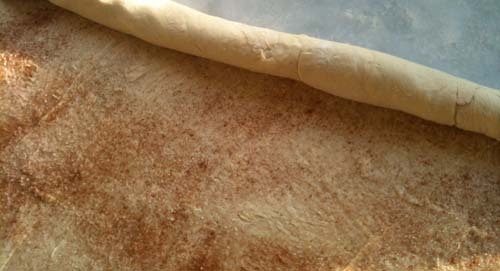 Make a roll after spreading sugar and cinnamon om the flattened dough. …or cut in slightly thicker slices, add a halfcut and make a halfknot. …and decorate with granulated sugar before putting them in the oven.